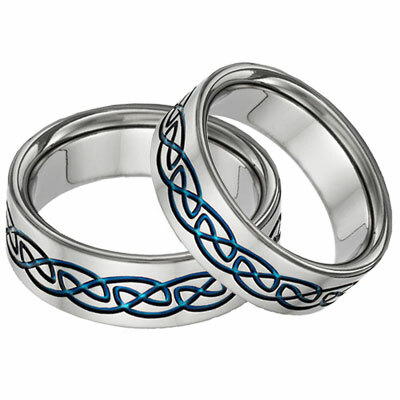 Add a burst of blue to your wedding jewelry with this titanium Celtic wedding band set. A vibrant titanium oxide, the result of an anodizing process, accents the Celtic knot engraved into this pair of contemporary rings. The hourglass-like infinity motif that drapes around this set is symbolic of a love that will endure no matter how much time goes by. Like all of Apples of Goldn++s titanium wedding bands, these rings are highly resistant to tarnish, and will never rust or corrode. We guarantee our Blue Titanium Celtic Wedding Band Set to be high quality, authentic jewelry, as described above.